This Tomato Garden Fall Cleaning Checklist 2 makes it simple to put to bed your veggie garden for the winter. Your first step was to clear out tomato plants. Now, you need to get all those tomato stakes, tomato trellises, and tomato cages out of your garden. But it’s an important step to take so that you are ready to plant tomatoes next spring. Here’s why. 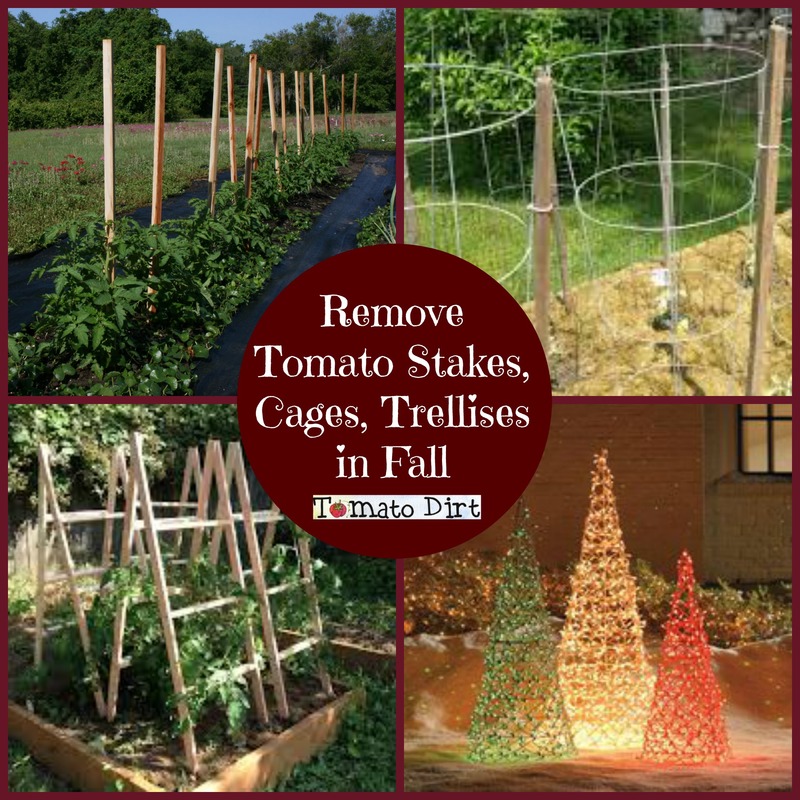 During the cold, gray days of autumn you may be tempted to leave your tomato stakes and cages in the garden. DON’T. Take a few minutes to pull out tomato stakes, trellises, and tomato cages. Dispose ties. Remove leftover bits and pieces of vines and leaves. Scrape off excess soil from supports that have been sunk into the ground. Prevent wear and tear. Winter can be tough. Give a stake a break. Bring it inside! Disinfect supports so they will be clean and ready to go next season. This is especially important if tomato plants have had any diseases – even a hint of early blight, late blight, Septoria leaf spot, or any kind of wilt. Fungi can overwinter and reappear on your new plants next year. Help prevent that now. Make a 10% bleach solution by mixing together 1 part bleach and 9 parts water. Use a pump sprayer to apply the solution to the supports. Allow supports to air dry, either in the garage or covered area if weather is inclement or in the sun. Bundle together tomato stakes with a sturdy rope. Roll or stack cages and trellises. Stack disassembled remesh cages. Unhook ends, unroll cages, and lay remesh flat – one cage on top of the other. Store tomato supports indoors to prevent rodents from using them for nests. Find a dry, cool corner of your garage, under the deck, or in a shed or barn. Cover the supports securely with a tarp. This tomato garden fall cleaning checklist 2 would not be complete without this fun tip: let your conical tomato cages have a second life after growing season by using them to make decorations during the holidays. Conical cages, when inverted, are the idea Christmas tree shape. Set tomato cages in containers or on a flat surface. Cover cages with lights, burlap, or ribbon to match your other holiday décor. Tomato cages also make great decorative Santas!